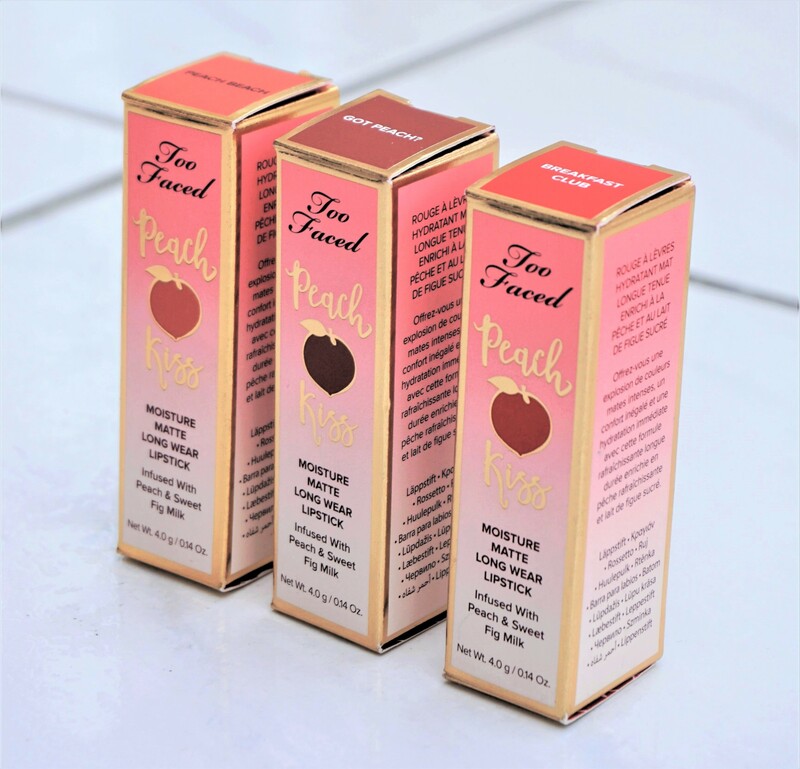 The Too Faced Peach Kiss Lipsticks come packaged in rectangular, cardboard boxes with a pink, peach and gold colour scheme. The front of the box provides the shade name and product name. 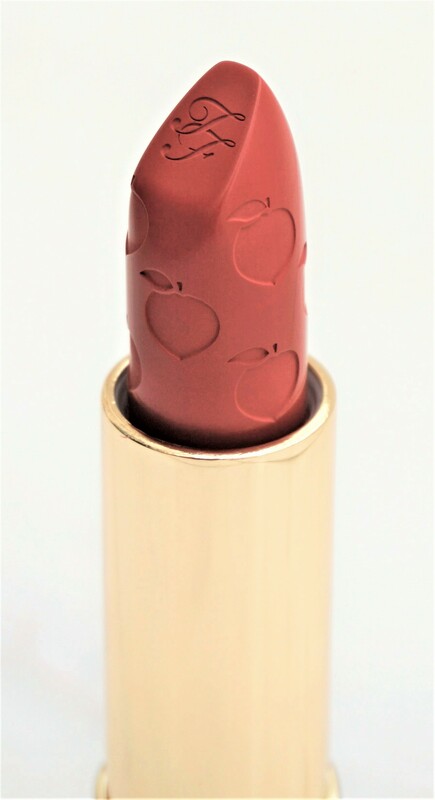 There is a picture of a peach to accompany the ‘Peach Kiss’ name coloured in the shade similar to the lipstick inside. 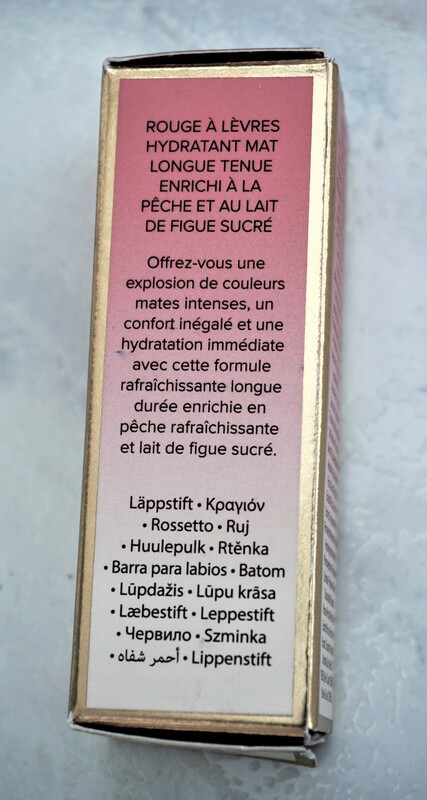 The box states that the lipstick is “Infused With Peach and Sweet Fig Milk”. The net weight of the product is 4.0g/0.14oz. The back of the box provides the ingredients list. The sides of the box (one side is in English, the other in French) provide information on the product (more on that under ‘Lipstick Claims’), distribution information, the Too Faced hashtag for the Peaches and Cream range (#TFPeachesandCream) and the Too Faced official website. The lids of the boxes provide the shade names and are coloured to match the shade inside. 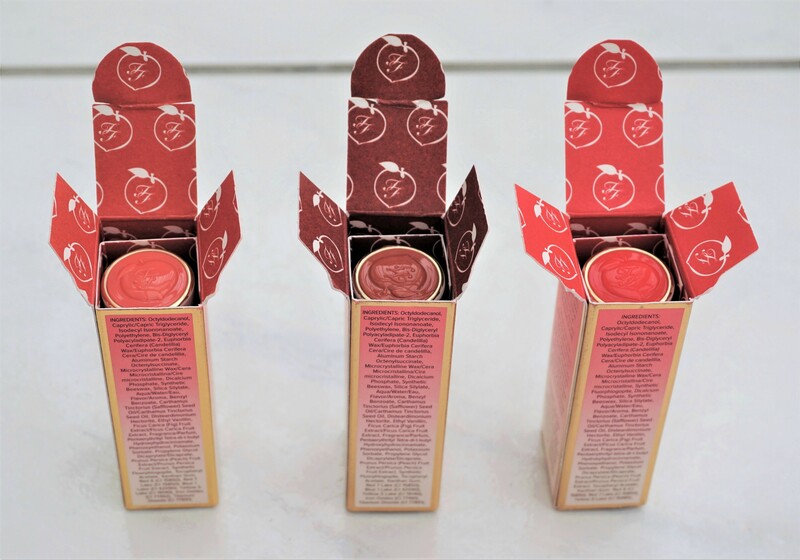 The inside of the boxes are printed with peaches and are also coloured to match the shade inside. I like that the lids and boxes match the shades as you can store the lipsticks in the boxes (or on their own) and easily find the shade you want in your make-up collection. The lipsticks come in a long, relatively wide, cream and gold tube. 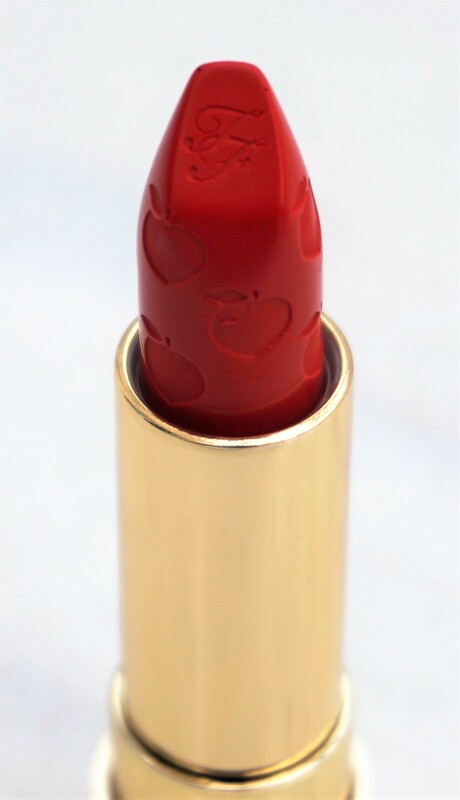 The brand name is etched on the lid of the lipstick, along the length of the tube. The tubes are relatively weighty and a little heavier than other lipsticks that I have tried. The Too Faced logo is printed inside a peach at the top of the lid, with gold around the outer edges. The top lid section is coloured to match the shade of the lipstick inside. I really like it when tubes are coloured to signpost the shade inside, as it makes it really easy to pick out the shade you want in your collection. The sticker on the base of the lipstick coloured to match the shade inside, just like the top lid section. The sticker also provides the shade name and distribution information. I really like the coloured sticker, as you can store your lipstick either facing upwards (due to the top lid colour) or downwards and easily pick out the shade you want. The lipstick tube is gold with the brand name printed in black along the length of the tube. The lipsticks come out or go back in the tube using the usual swivel up and down mechanism. Too Faced Peach Kiss Moisture Matte Long Wear Lipstick in Got Peach? The lipstick bullets have peaches printed all round on them, which I think is a lovely feature. I didn’t notice this feature in the shop for some reason but suddenly saw it when I opened the ones I had purchased at home. It gives the lipstick a really pretty, fun look. 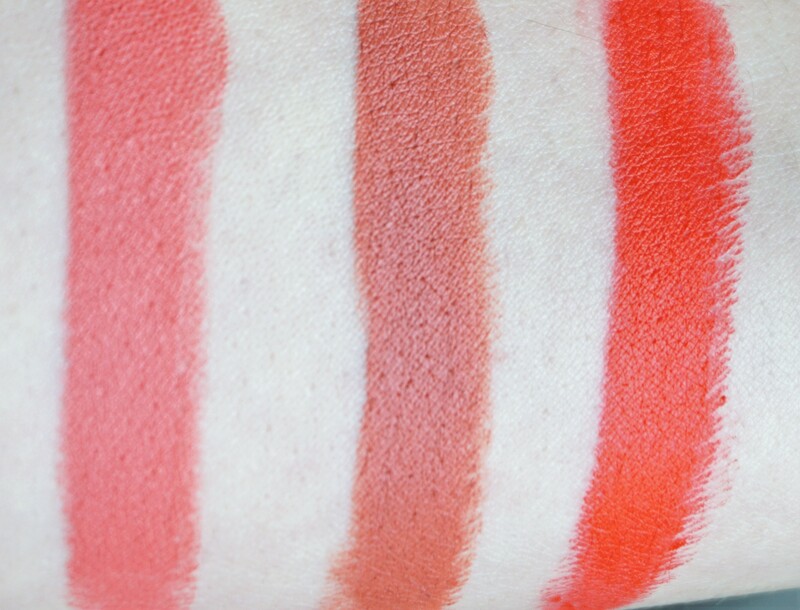 Close-up of Too Faced Peach Kiss Moisture Matte Long Wear Lipsticks in Got Peach? The lipstick bullets are slightly different from other lipsticks I have tried, in that the tips are squared off at an angle, rather than coming to a point. I like the square angled bullet style, as it makes it easy to get a crisp, defined application of lip colour on the lips. 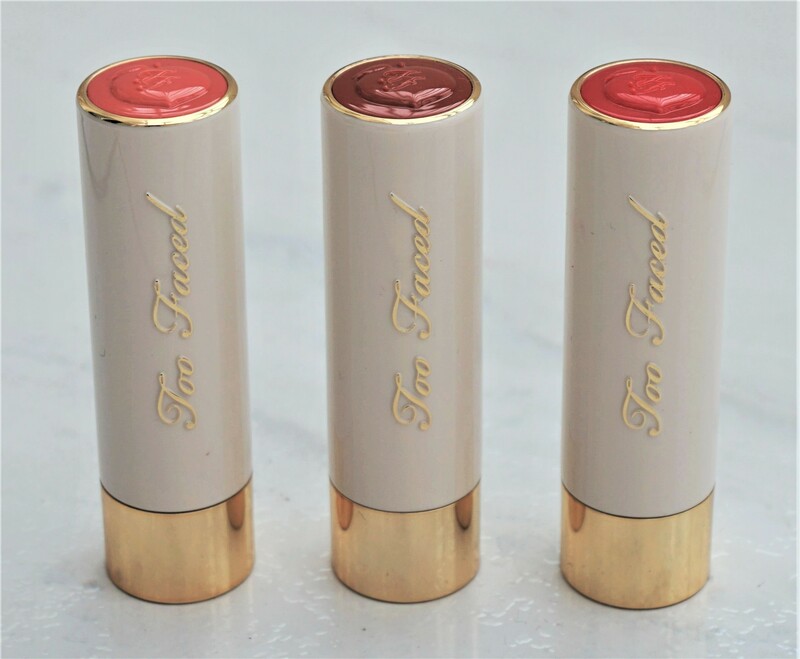 Like the other Peaches and Cream products, the Too Faced Peach Kiss lipstick tubes look beautiful, classy and chic. There is something so lovely about using a lipstick which looks amazing on the lips, has beautiful packaging and smells delicious! Whenever I take these lipsticks out of my handbag to re-apply them, it just feels so nice to indulge in something special. The box provides information on the lipstick. The blurb states: “Achieve a burst of intense matte colour, unsurpassed comfort, and hydration with this long-wearing refreshing peach and sweet fig milk infused formula”. The Too Faced website states that these lipsticks have “intense matte colour”, “8 hour long wear”, a “comfortable matte finish” and “intense pigment load and colour saturation”. I absolutely love these lipsticks, as they have intense pigment, feel so smooth and feel incredibly comfortable on the lips. As mentioned above, I bought Breakfast Club and then ended up going back to get some more as I liked them so much! The three colours I have cover a range of spectrums (neutral, medium and bright) and they are all extremely pigmented. The lipsticks look so vibrant and opaque, even with just one sweep across the lips. I like that the lipsticks are not sheer and elicit high impact colour quickly. They definitely have a high level of colour saturation to me. The lipsticks feel incredibly smooth and glide on to the lips. They don’t tug when I apply them and look smooth whether I choose to apply just one coat, two coats and top up across the day. The Peach Kiss lipsticks are advertised as having ‘unsurpassed comfort’ and a matte finish and I agree with both of these aspects. I think these lipsticks are one of the most comfortable matte finishes that I have worn. They give a classic, matte finish but my lips still look supple and smooth. I don’t find them drying to wear, which can sometimes be a feature of matte or liquid lipsticks. If you are on the look out for a comfortable, matte lipstick, then I highly recommend taking a look at the Peach Kiss range. They aren’t cheap as such (£19) but they feel amazing on the lips, are incredibly pigmented, opaque and smell wonderful! 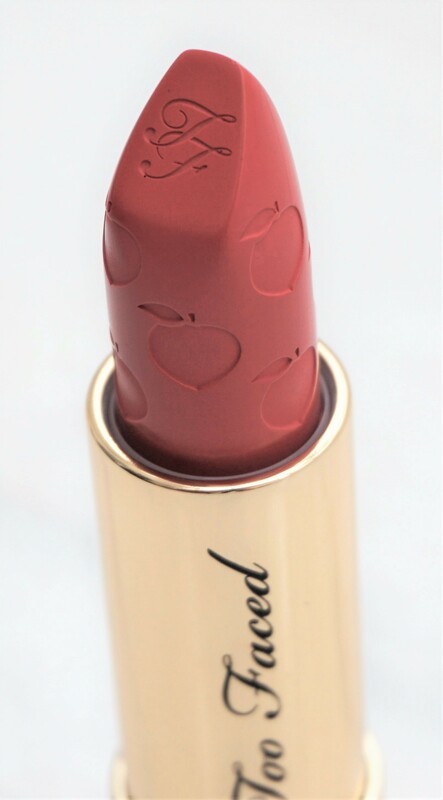 As with the other Too Faced Peaches and Cream products, the Peach Kiss Lipsticks are advertised as being “Infused With Peach and Sweet Fig Milk”. The lipsticks have a flowery peach scent with hints of vanilla. I’m not sure what figs smell like so I can’t say whether it smells of fig or not. The lipsticks have the same scent as the Sugar Peach Palette and Just Peachy Mattes Eyeshadow Palette (the other products I own from the range). I really like the scent and find it to be quite pleasant, fresh and not over-bearing. I find the scent very uplifting and it’s a really lovely treat when I open and apply the lipstick. I get a very slight waft of the lipstick when I wear it during the day, which I really like. If you are sensitive to scented products and don’t like them, then this lipstick might not be the best choice for you. If you are unsure about the scent, it’s worth looking at and trying on the lipsticks in person (if you can). If you can’t find the lipsticks, you can smell any of the other Peaches and Cream products to see if you like the scent. The Too Faced Peach Kiss Lipsticks are available in 20 shades, ranging from nudes, pinks, plums, peaches, corals, browns, oranges, reds and burgundies. I really like the range of colours available, as the shades cover the light, medium and deeper spectrums, as well as subtle, everyday, bright and intense colour pops. I have three shades at the moment: Breakfast Club, Peach Beach and Got Peach? Peach Beach is a medium peachy-coral shade. I love this sort of colour as it looks so fresh and uplifting. I like wearing this shade alongside neutrals, golds, peaches, cranberries and greens on the eyes. Got Peach? is a medium, rosy-toned brown shade. I don’t have a shade like Get Peach? in my collection and so it felt like it was quite unusual. I don’t usually suit brown-toned lipsticks but the slight rose tones add a subtle warmth to the shade and make it work on me. I love this type of shade with smokier looks and colourful eyeshadow combinations as it dresses the lips without making them clash with the eyes. I found it really hard to decide between Got Peach? and Chill Pill as there was a similarity in the tones of these two shades. Got Peach? is lighter, whereas Chill Pill is much darker. Chill Pill had a lot more orange in it and I felt like it looked very similar to MAC Chili, which I already own. I’m glad that I chose Got Peach? as I am wearing Chili today and it does look very like Chill Pill. Breakfast Club is an intense, bright orange-toned red. I’m a huge fan of Breakfast Club as it really brightens up your whole face. I love this sort of colour with neutral, champagne, gold or brown eyeshadow combinations so the lipstick really stands out. You can see a post of me wearing this shade here. The Too Faced Peach Kiss Moisture Matte Long Wear Lipsticks cost £19. Too Faced is available in the UK from Debenhams, Cult Beauty and Selfridges. 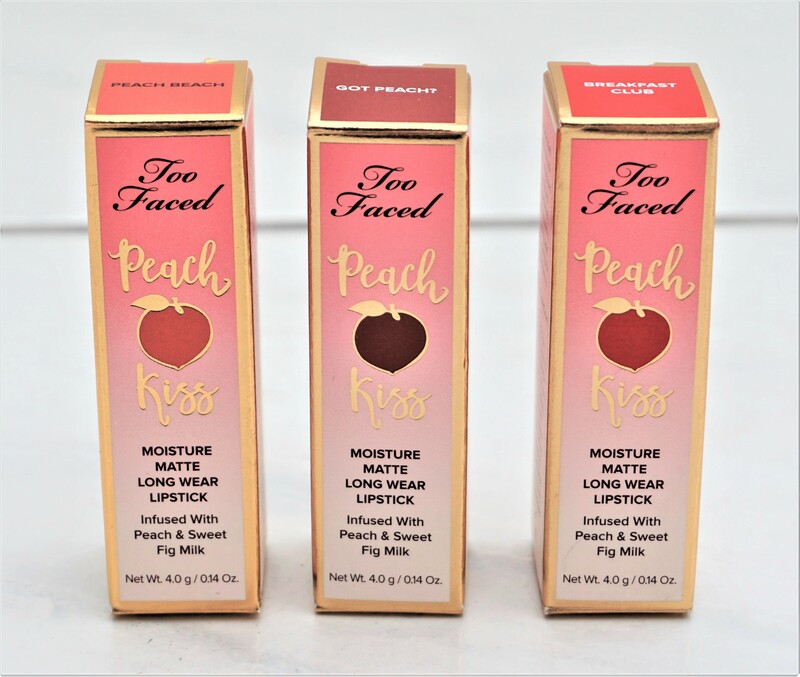 Have you tried the Too Faced Peach Kiss Moisture Matte Long Wear Lipsticks? Have you tried any of the other products in the Too Faced Peaches and Cream collection? Let me know in the comments section below.